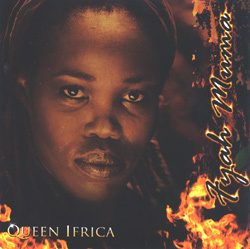 With a truly royal sound and style, Queen Ifrica’s debut release Fyah Muma, has been one of the most greatly anticipated albums of the year. Many of you have heard the numerous tracks on Fyah Muma, as singles that have been blazing hotta fyah in the dancehalls, radio airwaves, and performed by Queen Ifrica herself live on stage. This album is such a joy to review, because the music contained within is so rich with wisdom and healing vibes to keep your meditation focused and pure. Queen Ifrica exemplifies what consciousness combined with great talent can create in the studio. So many great songs are contained within Fyah Muma, that I assume most Big Up Radio listeners have already heard at least a few on our various weekly shows including interview on Reggae Makossa (Thursdays on Roots) with Makeda Dread on Thursday. Not only is this Royal Empress a dedicated singer, songwriter and performer but she often volunteers her time for community outreach programs. In particular the in area of Kingston 13, known as the S corner neighborhood. "Fyah Muma" is a must own roots reggae album of timeless proportions. Tracks like "Genocide" is a call to humanity to wake out of their slumber (figuratively speaking), and realize that the few that live in excess wealth are like vampires on the poor and the disadvantaged, sucking the life from those that need help the most. This song is a gift to those strugglin’ inna Africa, inna the Kingston ghettos, inna the projects of east Oakland, have faith in the Most High God. Queen Ifrica sings, " Praise the King and not another." "Babylon Blunder" is another serious minded song, and Fyah Muma just blazes dem wicked heathens!. On the "Get a Beaten" riddim, an uplifting song with such strength and determination delivered with pure clarity in the lyrics. Queen Ifrica notes "Life is worth more than a dollar bill." Resist babylon and stand firm! When I first hear the tune "Black People", and the inspiring lyrics within I thought to myself "I hope this song gets heard by all generations." There is a real positive message here and the vibes promote an upfulness not present in much of the mainstream music of today. The track "Sensimina" is just a pure niceness. Higher Heights fi real! As any herbsman or woman knows, Cannabis is a gift from Jah. This is our hola sacrament, from the days of King David, and Fyah Muma come to tell you some truth and rights. This is our brain’s food, Rasta knows this is the healing of all nations. " Herb over cigarette, life over death." Every Rasta know that "Natty Fi Grow" and dreadlocks are more than a fashion statement. For a Rasta’s dreadlocks is a part of their Nazarene vow, a Rastafari covenant. "Dash out yuh false hair, fire di barber" , "fire bun yuh pork chops, Rasta nah walk inna cemetery." Yes I, teach dem Queen Ifrica! "Zinc Fence" tells of the often overlooked, downtrodden communities existing in dire poverty. Why can’t we over come the greed in society and give a helping hand to the poor? That is what Father God requires, you overstand? Queen Ifrica impresses me with her devotion to those sufferahs inna di ghettos. There are also many nice time listening tunes, like "Need You". Build yuhself a spliff, kick back and lovepreciate that special empress(or king), inna yuh life. The Track entitled "Below the Waist" tells a story of how Man and Woman come together despite the difficulties of maintaining a relationship. Queen Ifrica sings "Him say gwaan put on yuh thong baby, an before yuh know it is another baby." In "Born Free" Queen Ifrica explains "Never want to get caught in their corruption", Mash dem pagans down. Good over evil every time. This message carries the vibes of true Rastafari inspiration. I hope this reaches dem inna South Africa, inna Somalia, and especially Sudan. Jah will shield his children, from the evil dragon. The track "Goodbye Love" presents another side of Queen Ifrica’s amazing vocal capabilities. This track proves what a multi-dynamic singer she is, and the lyrics tell the story of love lost. The pain of a break up can be hard, but you have to love yourself first and foremost, Seen? The one song that I personally feel has the most healing potential is "Boxers and Stocking." What a timely message. While wars are waged, and violence lurks in the ghettos, an Angelic voice commands, "hold on don’t give up now, be strong and trod along, have faith in the Most High, Rastafari" Blessed love is within all of us, conquer dem with love! There are many other noteworthy tracks on "Fyah Muma", such as "Randy", "When I Love", "Lengthen My Days" "Yesterday", "Mr. Bojangles", "Fyah Muma" and "Beautiful Day" Of course it goes without saying, that this a must have Cd for any serious reggae music collector. It should also be noted however that "Fyah Muma" will appeal to many with a broad taste of music genres as well. Shares this album with those that are close to you. Tell dem ’bout Queen Ifrica, and spread Jah message to those who have ears to hear this righteous Dawta of Rastafari.